If you'd like to monitor the location of Elon Musk's cherry-red Tesla Roadster as it travels through interplanetary space, astronomy apps like SkySafari 6 and Star Walk 2 can show you where it is at any given time. It will spend the next several months near Jupiter, rising before dawn in the southeastern predawn sky now and becoming an evening object by late March. Since its launch atop the SpaceX Falcon Heavy rocket on Feb. 6, Elon Musk's cherry-red Tesla Roadster has become the solar system's newest "minor body." Although the car, with its spacesuited mannequin named Starman at the wheel, is too small and too far from Earth to be seen by amateurs, professionals continue to capture images of its tiny point of light moving across the distant stars. A Hohmann transfer orbit is the most fuel-efficient method to travel from one planet to another. By timing the launch precisely, a spacecraft can coast between planets and arrive at the destination when the planet is passing the same location in space. If the spacecraft's trajectory isn't altered, it will continue to shuttle between the two planets' orbits forever. The Tesla Roadster was launched with a high enough velocity to reach beyond the orbit of Mars, but the timing wasn't designed for a Mars rendezvous. SpaceX used the Tesla Roadster's launch to demonstrate that payloads on the Falcon Heavy rocket could escape Earth's gravity well and travel to Mars and beyond. The Roadster was launched into a Hohmann transfer orbit. This is an elliptical orbit designed to use the least amount of fuel to shuttle a spacecraft between two bodies orbiting the same center of mass in the same plane — in this case, Earth and Mars. If a spacecraft in a Hohmann orbit doesn't land on — or enter orbit around — the destination body, its orbit will continue around the sun, eventually returning to Earth's vicinity, and then to Mars again, and so on. Some planetary exploration concepts use this shuttling idea to transfer supplies between planets — slowly, but cheaply. On Feb. 10, astrophotographer Paul Mortfield of Thornhill, Ontario, used his remotely operated 16-inch (406 millimeters) telescope to capture this sequence of images showing the Tesla Roadster's motion (left to right, above center) across the sky over the course of 1 hour. The Tesla Roadster is now orbiting the sun, not Earth, so it is technically considered a minor body or solar system object (or even an interplanetary spacecraft), and not a satellite. However, because it's an artificial object, some apps, including Star Walk 2, list it under Satellites. In SkySafari 6 for iOS, you can find it by typing "Tesla" into the search bar. The resulting list should include the Roadster, the asteroid (2244) Tesla and some features on the moon. If you don't see the Roadster listed, the app's minor-body catalog needs an update. SkySafari 6 and Star Walk 2 were the only sky-charting apps I found that included the Roadster, but other apps may add it in the future. Many astronomy apps automatically download object updates from time to time in the background or handle it through the regular app software updates. Because the Roadster is a brand-new object, it may not be present if your app's solar system object catalog is not up-to-date. Under the Settings menu, select Solar System, and scroll to the bottom of the page, where you will see a colored link labeled "Update Minor Body Data." Below this are the date and time of the last update. When you tap the link, the label will dim and change to "Updating Minor Body Data …" This can take a few minutes. You can exit the Settings menu and use the app while it downloads the update. When the update is complete, the app will alert you via a pop-up. My SkySafari 6 Pro minor-body update required 100 megabytes. The smaller object catalog in the Plus version will download less data. A fun extra that was recently added to SkySafari 6 is a 3D rendering of the red Tesla Roadster in space (minus the Starman driver and the Falcon Heavy upper stage which is still attached to the car). Visit the Apple store to update it if your app is not version 6.0.4.30 or later. This icon is not yet available to Android users. And as of this writing, the latest Android version of SkySafari 5 Plus, version 5.4.0.0, did not include an accurate orbit for the Roadster. But this should be remedied soon. In the SkySafari 6 app, you can generate a 3D rendering of the Roadster's orbit at any date and time. Select the sun and tap the Orbit icon. Then, search for and select the Tesla Roadster. It will appear with a green symbol and orbit. When you rotate the modeled planetary orbits, the app will show that the Roadster is orbiting the sun in the plane of the solar system, shuttling between the orbital distances of Earth (blue) and the inner asteroid belt, just beyond Mars' orbit (brown). 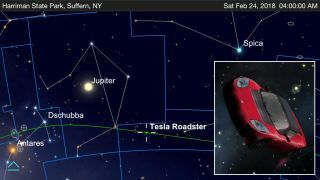 To get an idea of where the Tesla Roadster is going to spend the next few million years, you can use the SkySafari 6 app to display its orbit around the sun. Here's how. Search for the sun, and tap the Orbit icon. (It doesn't need to be daytime.) Pinch or expand the display until the orbits of the inner planets out to Mars are clearly shown. Next, open the Search menu, and type "Tesla." Select the Roadster, and its Object Info page will appear. Now tap Done. The current location of the Roadster and its orbit around the sun will appear, highlighted in green. If you don't see the Tesla's orbit, ensure that the app's Show Selected Object Orbit setting has been enabled. You can find the details about the Roadster's orbit on its Info page. The Roadster is orbiting the sun once every 571 days. The orbit's closest distance from the sun (shown in the app as the periapse value) is 0.986 astronomical unit. (One AU is the average Earth-sun distance — roughly 93 million miles, or 150 million kilometers). The orbit's closest distance from the sun, therefore, equals 91.66 million miles (147.5 million km) — close to the Earth's perihelion distance, or the closest Earth gets to the sun. The car will cross Earth's orbit every 19 months or so, but we won't always be there to meet it. More on that later. At the Roadster's farthest distance from the sun, known as its aphelion, the car will reach about 1.71 AU, or about 11 percent farther than Mars' mean orbital radius of 1.530 AU. At this distance, the car might encounter some main-belt asteroids. The asteroid designated 7 Iris has a similar perihelion but a much more elongated orbit than the planets have. Companies that are interested mining asteroids want to be able to deliver payloads that far from the sun. The Roadster's orbital inclination has a very small value of 1.1282, meaning it orbits nearly in the plane of our solar system. You can demonstrate this in SkySafari 6 by using one finger to rotate the 3D-rendered solar system. Will the Tesla Roadster return? Once you have the app set up to show the Roadster's orbit, you can open the Time control and run time forward or backward, continuously or stepping through in selected time increments, to see where the Roadster will go from here. To find out when the Roadster will next pass close to Mars or Earth, advance the date in the app month by month until planet and car symbols converge. The Roadster will cross Mars' orbit in early July 2018 and again in mid-April 2019, but the Red Planet will not be nearby. The Tesla will next cross Earth's orbit in early September 2019, but Earth will be on the opposite side of the sun. The left panel shows the search results after "Tesla" was typed into SkySafari's search bar. If the Roadster doesn't appear, try updating the app's minor-body catalog. On the right, the Tesla Roadster's Info page provides the rise, transit and setting times for your location, and the object's current orbital parameters. The opportunities for the Roadster to pass near enough to Earth to be captured by our planet's gravity are slim indeed. In fact, the next closest approach of the car and Earth will occur somewhere around New Year's Day of the year 208,417! (I used the least-common multiple of the two objects' orbital periods to calculate that timing.) You can plug that date into SkySafari 6 and see the encounter for yourself. (To enter such a large year, open the Date and Time settings, and tap Advanced. Then, manually enter date, and tap Done.) Zooming the display will show that the Roadster won't come closer than the moon's distance from Earth. All of the information above is based on the current orbit. Over time, this may change due to solar heating and gravitational tugs by other solar system objects. Scientists recently calculated that the chances of the Roadster colliding with Earth within the next million years are about 6 percent, and 2.5 percent for colliding with Venus. If the Roadster does ever fall to Earth, though, it will harmlessly burn up during re-entry. Where is the Tesla Roadster in the sky? When you are finished seeing the Tesla Roadster's orbit, tap the Orbit icon to return the view to the sky from your location on Earth. In this mode, you can see where in the sky the Roadster is positioned at any given time. On Feb. 24, 2018, the car is sitting off the tail end of the constellation Hydra, near the deep-sky object NGC 5694. This is about 14 degrees southwest (to the right) of Jupiter in the southeastern predawn sky. Some of the Roadster's future milestones include crossing Mars' orbit outbound in early July 2018 (left panel), crossing it again inbound in mid-April 2019 (center panel) and completing its first full orbit around the sun around Aug. 31, 2019. But on that date, Earth will not be there to meet it — we'll be on the opposite side of the sun (right panel). In its present orbit, the Starman-driven car is not expected to pass close to Earth or Mars for thousands of years. A new website created by Ben Pearson, called Whereisroadster.com, lets you track the car from your computer or phone browser. It contains a simple animation showing the Roadster's position in the solar system, lists some upcoming encounter dates, answers some frequently asked questions and even gives you the estimated "miles per gallon" of the vehicle and the number of times Starman has heard "Space Oddity" (assuming the battery still works). It's all good fun. In future editions of Mobile Astronomy, we'll look at spring galaxies, how the distances to stars are measured and more. In the meantime, keep looking up! Editor's note: Chris Vaughan is an astronomy public outreach and education specialist at AstroGeo, a member of the Royal Astronomical Society of Canada and an operator of the historic 74-inch (1.88-meter) David Dunlap Observatory telescope. You can reach him via email, and follow him on Twitter @astrogeoguy, as well as on Facebook and Tumblr.